The Mystara RPG setting has a magazine devoted to it called Threshold. 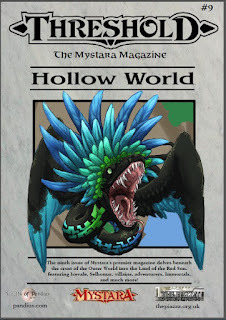 Issue number 9 is devoted to the Hollow World part of that setting! The new issue of Threshold, the fan magazine entirely devoted to the Mystara setting for Classic D&D, is now available for download (of course for free). Here is the announcement from one of the editors:"I'm very happy to announce that Issue #9 of the Threshold Magazine is available now from the Vaults of Pandius! In this issue we cover the Immortals and their Hollow World playground that was first introduced to us by Aaron Allston back in 1990. Argentmantle delves into the unique culture of the Icevale Elves, and Geoff Gander explores the history of Selhomarr. The life cycle of megaliths is unfolded before our eyes (as told by LoZompatore) and the Signs of the Universe (by Sturm) are laid bare.... and so much more. A heartfelt thank you goes out to all those who answered Threshold's call for support - we have some new names on our team as well as many of the ones you are already familiar with. I would also like to take the opportunity to thank julius_cleaver for stepping up to the plate and taking on the role of editor-in-chief for our next issue - Elves! Thank you to all of the contributors and Threshold staff that worked on this issue. I'm very proud of the material that we have turned out, and I hope that you enjoy reading through this issue as much as we enjoyed putting it together. As always, feel free to use this thread to send us comments and feedback on this issue. Here is a link to the PDF of the issue.